Hi Carly, you do not need to read my books in order. 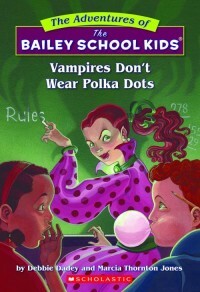 Brandon, I'm happy you like Vampires Don't Wear Polka Dots. It was my first book! Dylan, the characters I write about are based on a mix of everyone I have known and even myself. A big hello to Kensey and Michelle. Ariana, glad you enjoyed Werewolves Don't Go To Summer Camp. It's fun writing about werewolves! 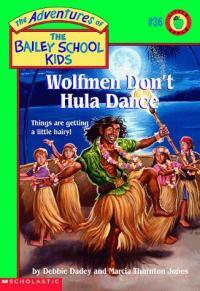 Have you seen Wolfmen Don't Hula Dance? Christina, I haven't seen the Yogi Bear movie, but when I was growing up there was a Yogi Bear cartoon based on the same characters. It was funny. Merry early Christmas to you too. Elijah and Alayna, my awards are listed by the individual book on the book pages. I live in Pennsylvania and don't have a cat. It takes me longer than a day to write a book! One book took me eight years! I have written about twenty books by myself and the rest with Marcia Jones or my son, Nathan. Elijah, I'm delighted you like Mrs Jeepers on Vampire Island. Alayna, I used to be a first grade teacher and then a school librarian before becoming a full time writer. I usually write chapter books, although right now I am rewriting a time travel book that is longer. I like funny books, mystery books, and books about nature and history. Hey Danielle, when I was growing up I wanted my name to be more unusual-a girl in my school had the exact same name! 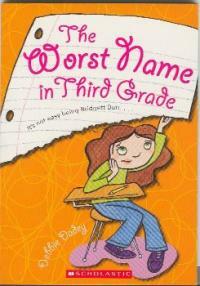 But I didn't want it to be The Worst Name in Third Grade. 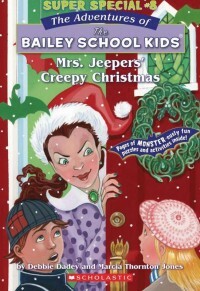 Greetings to Mrs. Copes' class, hope your author study is going well. Did you see my bulletin board? To answer your questions: 1. No, I do not have another job, but I used to be a teacher and then a school librarian. 2. It takes different amounts of time to write a book: from one week to eight years. 3. How many books I write in the new series depends on how well they do. If alot are sold the editor will ask me to write more. 4. I think it would be great to have my books made into a TV show. Do you know anyone who works in television? Christina, I do like pumpkin pie. But my favorite is probably the Cherry Delight that my mom makes. It's so yummy! Did you know I used to work at McDonald's in high school and college? Holy Toledo! Can you believe it's almost Thanksgiving? Are you ready for a vacation from school? My kids get off the whole week! 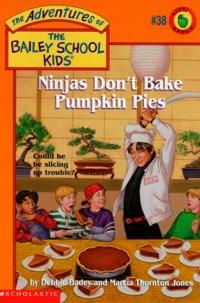 Watch out for ninjas stealing your pumpkin pie. As for parents stealing Halloween candy, I can only offer one suggestion. Frances, maybe if you put your candy away your dad won't be tempted! I tell my son to hide his! Noah, Troy, and Michelle-a big hello to you. Kate, I hope you have great weather for camping. You sound like an amazing reader. I'm so happy you liked Skeletons Don't Play Tubas. I like the scene where they hear noises in the hallway and get scared. Molly, my husband just got back from a business trip to Boston. Hope you have fun there. Christina, my husband has a Harley Davidson motorcycle and he takes me for rides sometimes. I used to have a scooter, but I sold it. I'd love to get a Christmas card from you. You can send it to me at Scholastic 557 Broadway Ny, NY 10012. Carly, I am very excited about my new series, Mermaid Tales. I have written four books so far: Trouble at Trident Academy, Battle of the Best Friends, Whale of a Tale, and Danger at Trident Academy (that last title may change it's name). I can't wait until it comes out. Hi Christina, maybe you should ask your librarian to order more of my bo oks! You can tell her I suggested it since they were all checked out. I handed out lots of candy for Halloween, but I was a biker in a leather jacket at a party the night before.